Includes Airfare: YES, from most major Cities in US & Canada. 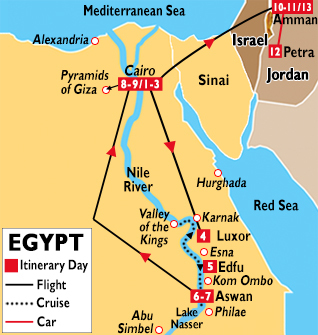 Accomodation Type: Hotel and 5* Nile River Cruise. International Flight to Cairo. Departures from most major Cities. Our representative will meet and assist you to your Hotel. Rest of the day at leisure. Overnight in Cairo. 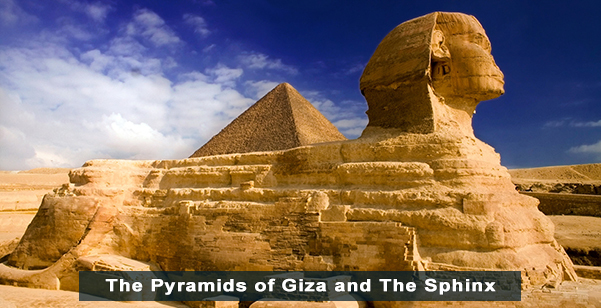 - Visit the majestic Pyramids of Giza, Cheops also called the great Pyramid, Chephren and Mykerinus, one of the seven wonders of the ancient world, to the south of the great Pyramid the legendary Sphinx a mysterious creature with a lion's body and a human face. - Memphis and Sakkara: Memphis capital of Egypt in ancient times, the must see here is the larger than life statue Colossi of Ramses II, the king lies on his back on a special pavillion. 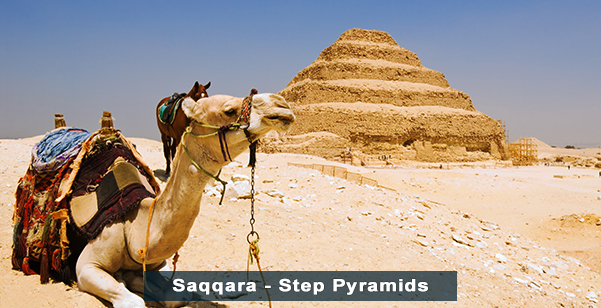 Sakkara, here you will find the first pyramid or Step Pyramid as it's known and surrounding enclosure of Zoser King of Egypt in 2667 B.C. 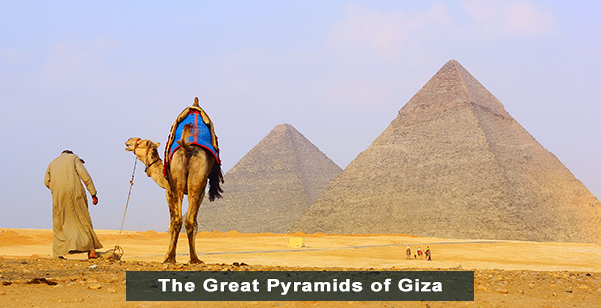 - Optional Tour: In the evening return for a Sound and Light Show at the Giza Plateau. 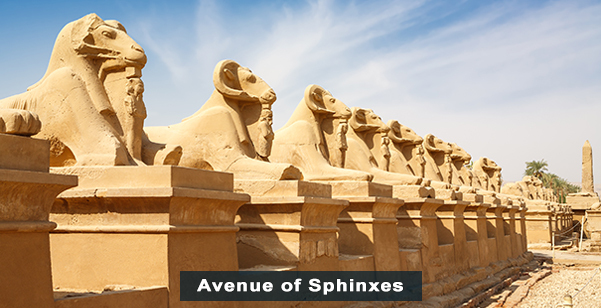 See the Pyramids and Sphinx illuminated at night while listening to their magical history. Breakfast, Lunch, Included. Overnight in Cairo. Transfer to the airport for your flight to Luxor. Our Representative will meet and assist you board your 5* Nile Cruiser. 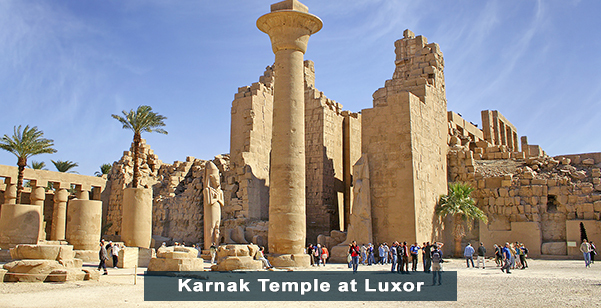 - Luxor and Karnak Temples, the best introduction to greatness of Upper Egypt. - Karnak the largest and most imposing Temple complex ever built, it was the Center of Egypt were the Pharaos lived, dedicated to Sun God Amon. - Luxor, this temple seats right beside the Nile, surrounded by the now modern town of Luxor, starts by an avenue of Sphinxes wich originally went all to way to Karnak 2 km. to the North. Breakfast, Lunch, Dinner included. Overnight in Luxor. - Valley of the Kings. Burial place of many of the new Kingdom Pharaos, including Tutankhamun and Ramses the Great, here you can venture in to some of the tombs. 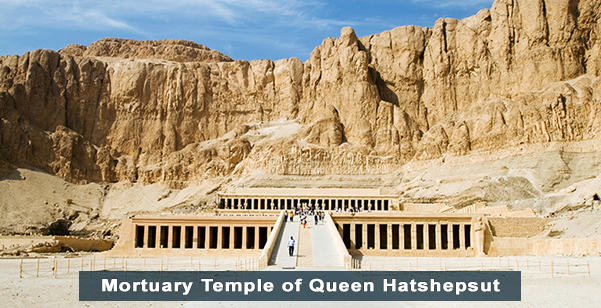 - Temple of Hatshepsut, the only woman Pharao to rule ancient egypt, this temple blends beautifully in a bay of cliffs knowns as Deir El Bahri. - Valley of the Queens, burial place for Royal brides, princes, and princesses, only a handful of tombs are open to the public, the most famous that of Nefertari Ramses favourite wife. 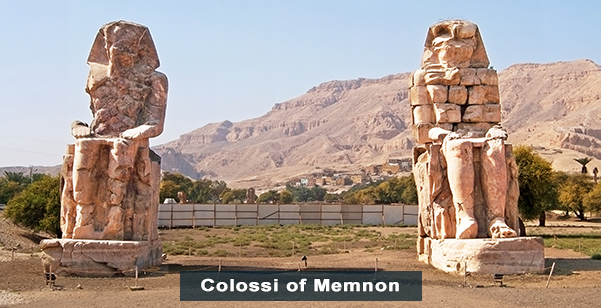 - Colossi of Memnon. Two giant seated figures that is all that remains of the Great Temple of Amenhotep III, although damaged they are impressive. Breakfast, Lunch, Dinner included. Overnight on board while sailing to Esna and Edfu. - Esna, on the west bank of the Nile, it's main attraction the Temple of Khnum and the crossing of the Lock, a small but very interesting crossing to watch from the deck of your boat. 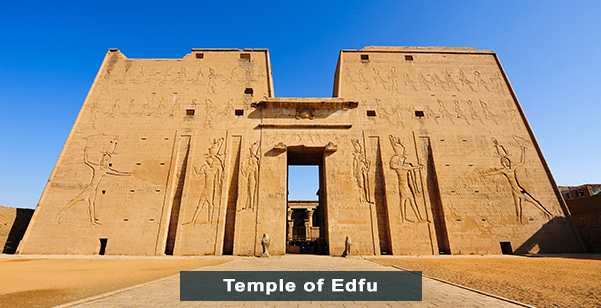 - Edfu, travel by horse drawn carriage between the Temple of Horus one of the best preserved Temples of ancient Egypt, the Temple of Edfu is located some distance inland. 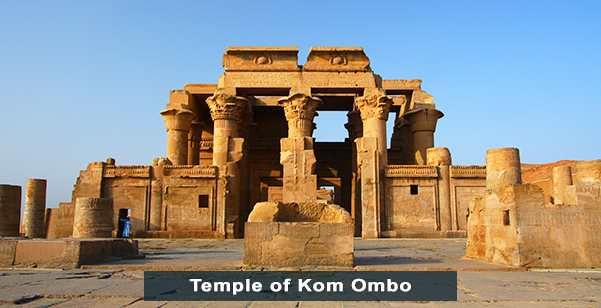 - Kom Ombo, beautiful waterfront Temple dedicated to the Cocodrile God Sobek, and Haroeris witha Falcon Head, it was completed during Roman times. Breakfast, Lunch included. Tonight enjoy an Egyptian Galabya Dinner Party, a fun filled evenning. Overnight on board, sail to Aswan. - Aswan High Dam, just north of the border with Sudan, a huge rock filled dam, which captures the world's largest river: the Nile, and its reservoir: Lake Nasser. - The Unfinished Obelisk, perfectly shaped but still attached to the rock, left there after discovering a crack, it would have been the biggest ever erected. - Philae Temple, located on a Island, one of the most romatic monuments dedicated to the Goddess Isis. This Temple was reconstructed on the Island of Aglika, from it's original Philae Island, due to the construction of the High Dam. 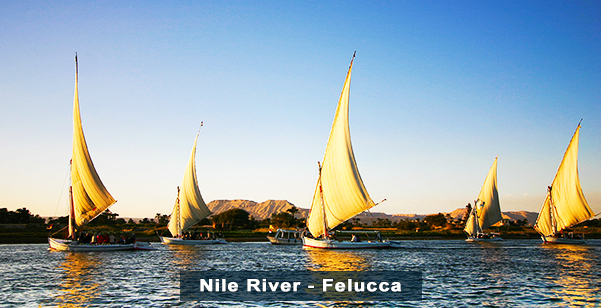 - At sunset board a traditional Nile "Felucca" and sail on the river arround Aswan's botanical gardens. Breakfast, Lunch and Dinner included. Overnight on board in Aswan. Today you will be transferred to the airport for your flight to Cairo. Our representative will meet you and transfer you to your hotel. Overnight in Cairo. 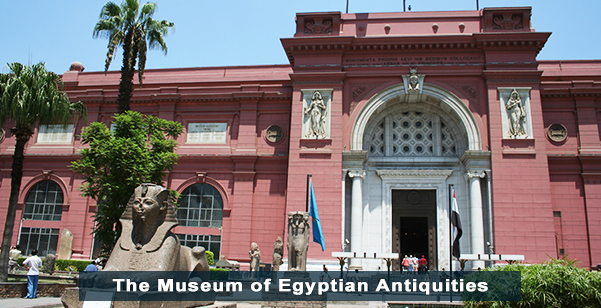 - The Egyptian Museum In Cairo, houses more than 120,000 items of antiquity a fascinating Museum dedicated to the legacy of the Pharaos and life in ancient Egypt. Not to be missed the Mummy's room and the Tutankhamun Galleries. 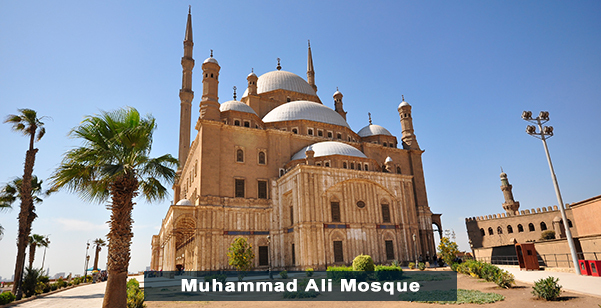 - The Citadel built in 1183, offers breathtaking views of the City, with the most visible monument in Cairo the Muhammad Ali Mosque. - Khan Al Khalili, One of the world's oldest and most traditional shopping districts, here you will find great souvenirs, antiques, jewerly, food street vendors, spices perfumes, a place to put your bargaining skills to use. Breakfast, Lunch Included. Overnight in Cairo. Transfer to the airport for your flight to Amman. Our Representative will transfer you to your Hotel. Overnight in Amman. 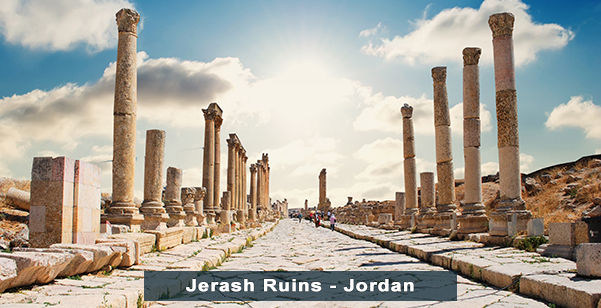 - Amman, enjoy a half day sightseeing a fascinating City spread over several hills, stroll the popular Jabal Amman one of the seven hills that originally made up Amman. Not to be missed: the Citadel Hill the hightest point in Amman offering great views. At the foot of Citadel Hill lies the Roman Amphitheater still used for perfomances today. 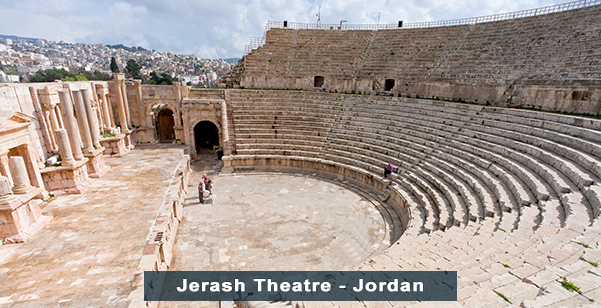 - Jerash: 30 minute drive from Amman you find one Jerash one of the most beautifully preserved Greco Roman Cities, stroll thru amphitheaters, roman baths, and several temples. Depending upon the time you may enjoy chariot races show at the Hippodrome, re-enacted like the old times. Breakfast and Dinner included. Overnight in Amman. - On your way to Petra stop for a quick dip in water 10 times higher in density than any othersea: The Dead Sea An experience to remember. - Petra, also known as the "Rose City, only accesible by passing thru the steep high sandstonewall of a narrow gorge, a breathtaking experience. Petra is half built and half carved into the rock. Petra is one of the New Seven wonders of the world and an UNESCO protected site. High Place Petra. Visit this ancient place of worship at the top of Al Kubtha Mountainwith great views of the Royal Tombs and the beautiful colors in the rocks along the way. - The Treasury Petra, one of the most famous monuments in Petra, with a beautifully carved facade. 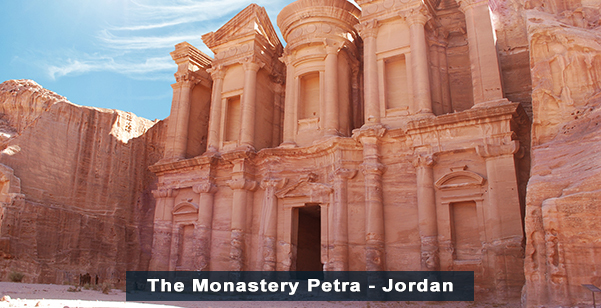 - The Monastery Petra, also known as El Deir, two stories high and with a magnificent Urn. It has one of the largest facade in Petra. - The Palace Tomb, one of the three Royal Tombs, an imitation of a RomanPalace, considered the largest monument in Petra. Breakfast and Dinner included. Overnight in Petra. Today Transfer to Amman for your flight back home. Tour Ends. Platinumholidays.com specializes in cheap Jordan Tours and affordable Jordan Holidays. 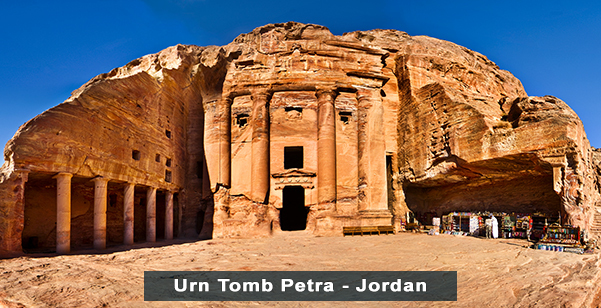 We offer packages with tours to Amman, to Petra, to Jerash and to Dead Sea. We have great deals to Jordan. Any type of tours to Jordan we have it, even tours that will take you to other countries like Israel and Egypt. All our tours can be customized to meet your needs and they have connecting flights available from major cities in Canada. Plus our tours have Private Expert Guides and air conditioned vehicles.